Follow Saint Vintage at celebrity parties, functions, and events! Actress, Model, and now Saint Vintage Model Jaime King sporting the latest Saint Vintage original. Saint Vintage covered by Extra at Variety Magazine’s 2015 Power of Women Luncheon honoring Oprah Winfrey. Everyone’s favorite Go To Girlfriend, Sadie Murray, features Saint Vintage as a brand that gives back during Breast Cancer Awareness month on KCRA News. 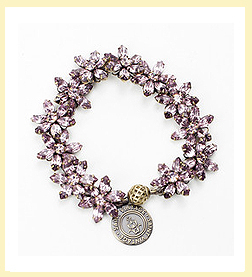 The Today Show with Kathie Lee and Hoda features Saint Vintage as a brand dedicated to giving back to cancer research. Glamour magazine features the Saint Vintage Crown ring in their September issue as a romantic trend for the season. Hart of Dixie' star Kaitlyn Black wears our SV Couture bracelet to the Junior League of Los Angeles Celebrity Masquerade Ball. 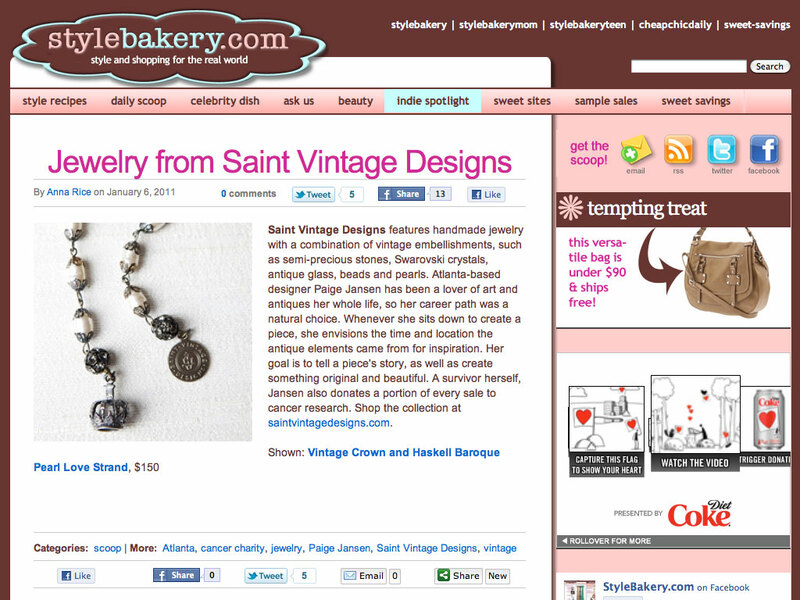 The Saint Vintage Isabella love strand is featured as a Sadie Murray favorite gift for Mother’s Day on CBS radio. The Today features a Love Strand on their Ambush Makeover with Kathie Lee and Hoda. Bisous Magazine features a SV Couture tassel necklace as a perfect "Layer It On” piece in their Spring 2015 issue. Saint Vintage cuff bracelet and floral burst necklace are featured in the New York Daily News. EW features an article on actress Taraji Henson wearing Saint Vintage bracelets. Edie Campbell Rocks Spring’s Best Denim wearing Saint Vintage Earrings. Demi Lovato wears a Saint Vintage bracelet at the unite4: humanity Gala at the Beverly Hilton Hotel. Saint Vintage founder and designer Paige Jansen-Nichols attends the 2nd Annual unite4: humanity at the Beverly Hilton Hotel in Los Angeles, California along with stars like Halle Berry, Queen Latifah and Jeff Bridges. People StyleWatch features Saint Vintage Love Drops in their “Shop and Do Good” article in their February 2015 issue. 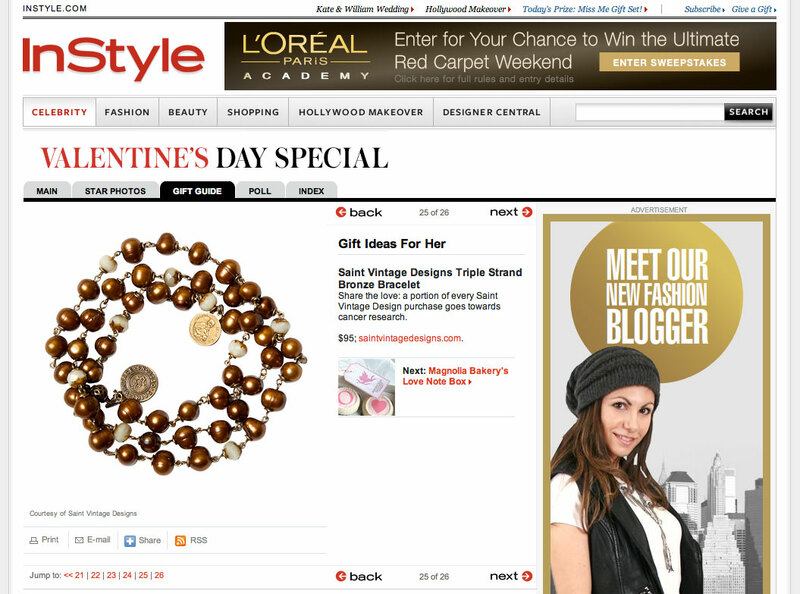 Style expert Sadie Murray highlights Saint Vintage Love Drops as the gift to give in her Valentine’s Day gift segment on Extra! TV. Star Magazine features Saint Vintage Love Drops in the January 26, 2015 issue. OK! 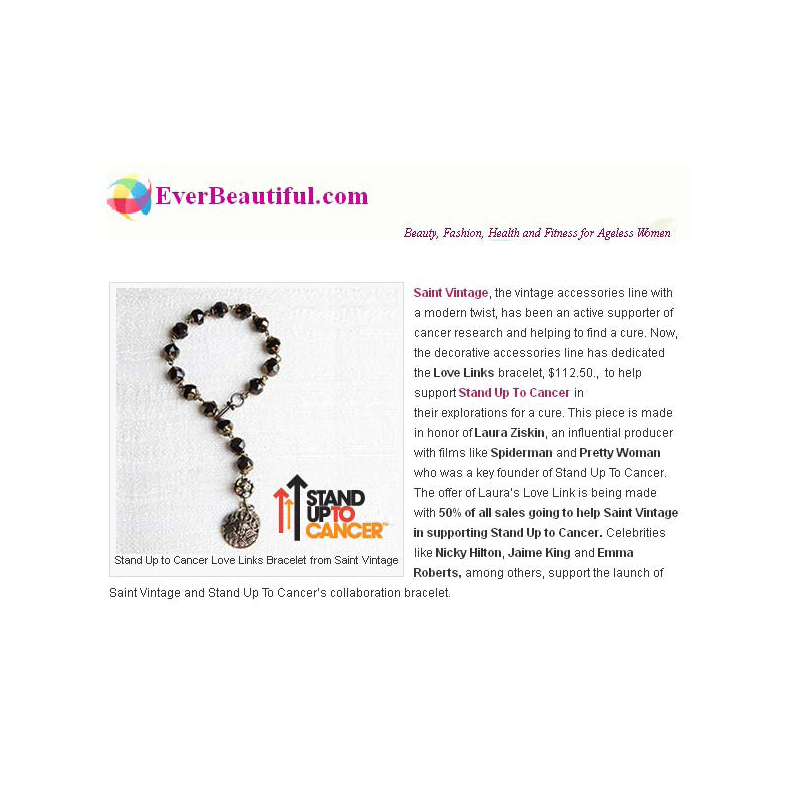 Magazine features Saint Vintage Love Links in their “Sparkling Ways To Give Back” article in their January 19, 2015 issue. Bisous Magazine features a Saint Vintage Couture ring on the cover of their Winter 2014 issue. Saint Vintage Couture Collection featured on E! star Giuliana Rancic's 2014 gift guide. Fashion website, Style Blazer, features Saint Vintage on their Cyber Monday deals to watch for holiday gifts. The Fabulous Report features Saint Vintage on their list of best Cyber Monday deals for the holiday season. Star Magazine features Saint Vintage as one of the best deals for the holiday season. Latina Magazine features Saint Vintage in their holiday gift guide. 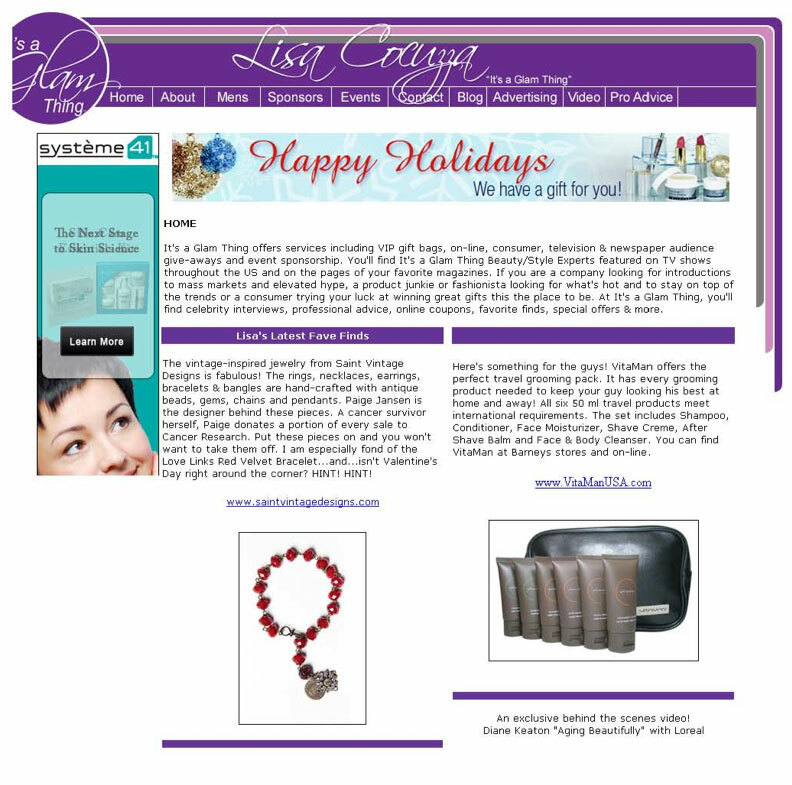 Health and wellness website, Neuroflex features Saint Vintage in their Gifts that Give Back holiday gift guide. 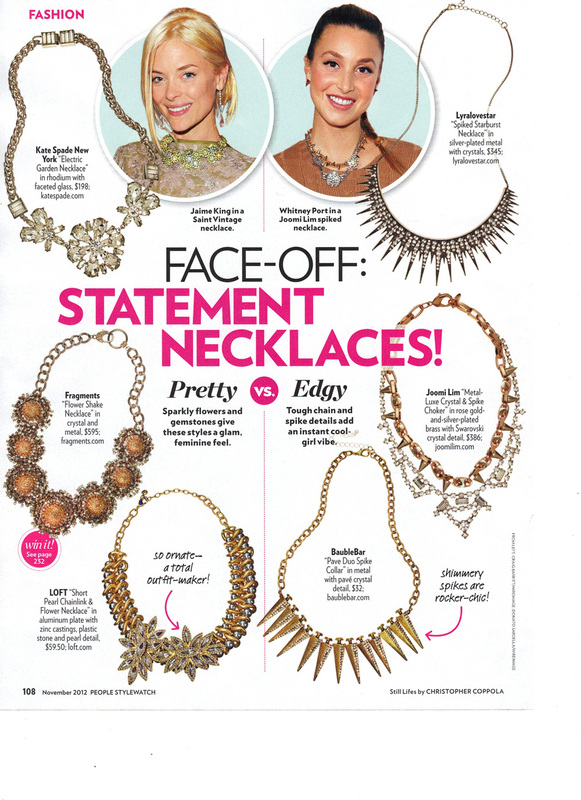 Us Weekly Magazine features Saint Vintage’s Love Links as the perfect go to holiday sparkle. Parents-to-be Wes Chatham and Jenn Brown attended the Los Angeles premiere of The Hunger Games wearing Saint Vintage Couture jewelry. Saint Vintage is covered by Bisous Magazine in their Cyber Monday Roundup. Saint Vintage is featured by Style Blazer for one of the best Cyber Monday deals. Star Magazine features Saint Vintage's Go Pink Campaign. Saint Vintage is highlighted as an “Eyecather” by Nedra Rhone of the Atlanta Journal Constitution. Saint Vintage’s Floral Eternity Love Drop Earrings are featured in the "21 holiday presents that will make her day” gift guide by online newsmagazine, Retail Me Not. Saint Vintage is covered by online magazine, Live Bold Style. 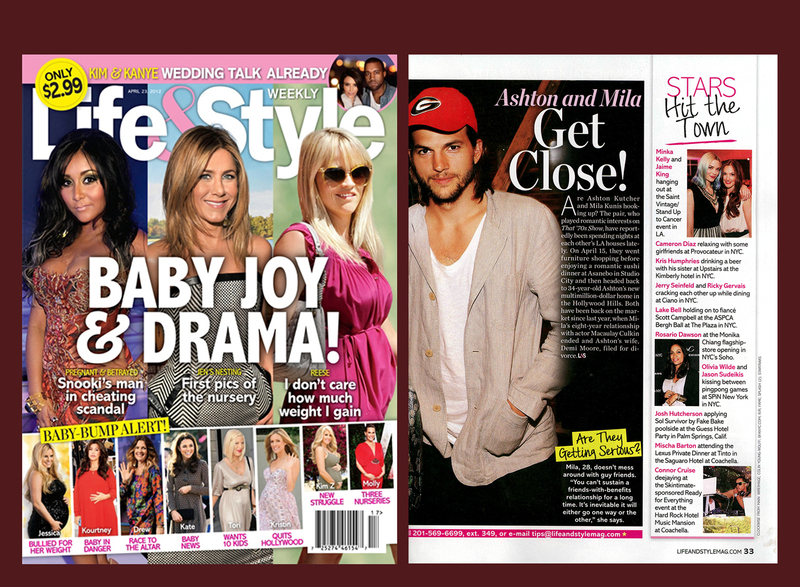 Saint Vintage founder and designer, Paige Jansen-Nichols is covered in Life and Style magazine. 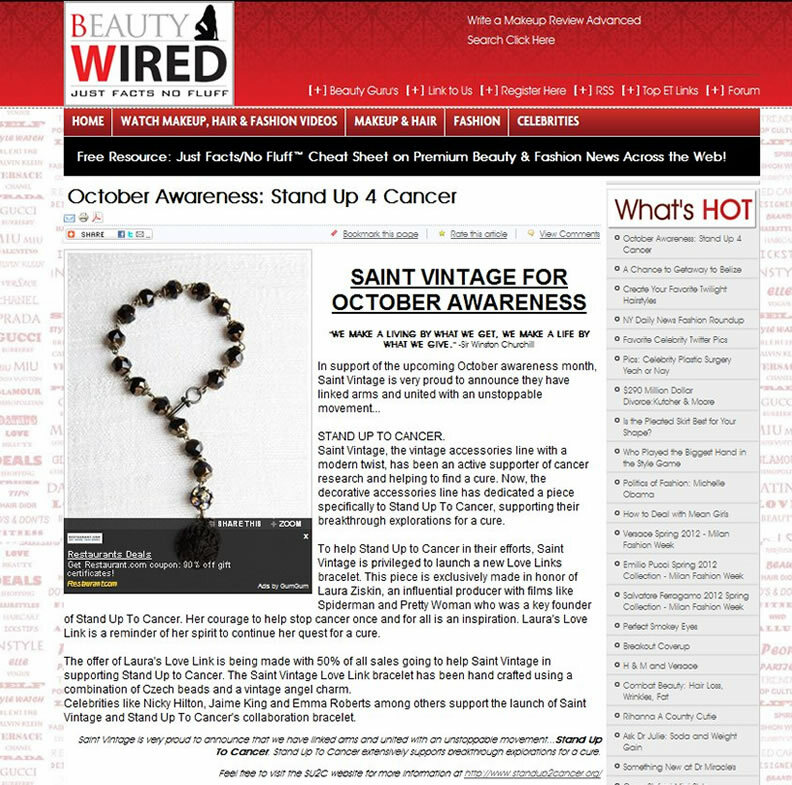 Lifestyle expert Sadie Murray names Saint Vintage as one of her “must-haves” during Breast Cancer Awareness month. Co-Host Tamera Mowry wears Saint Vintage Couture Bracelet on her talk show The Real. Quest, a New York regional luxury magazine, features Saint Vintage Golden Orange & Green Petite Fleur Bracelet. Nikki Reed shops Saint Vintage at Variety Magazine’s Power of Women Luncheon. Dascha Polanco loves her Saint Vintage Couture Bracelet. Bryce Dallas Howard wears Saint Vintage Couture at Variety Magazine’s Power of Women Luncheon. Constance Zimmer loves her Saint Vintage Couture Hoop Earrings at the Power of Women Luncheon. Saint Vintage covered by Vanichi Magazine at Variety Magazine’s Power of Women Luncheon. Saint Vintage founder Paige Jansen-Nichols' participation in Power of Women luncheon is covered by Atlanta Journal Constitution. Saint Vintage covered by Extra at Variety Magazine’s Power of Women Luncheon. Saint Vintage covered by E! Online at Variety Magazine’s Power of Women Luncheon. Saint Vintage covered by People Magazine at Variety Magazine’s Power of Women Luncheon. Saint Vintage founder and designer Paige Jansen-Nichols with Variety Magazine’s Power of Women Honorees Jennifer Lopez and Viola Davis. Saint Vintage covered by Access Hollywood at Variety Magazine’s Power of Women Luncheon. Diana Madison wears Saint Vintage on Hollyscoop. 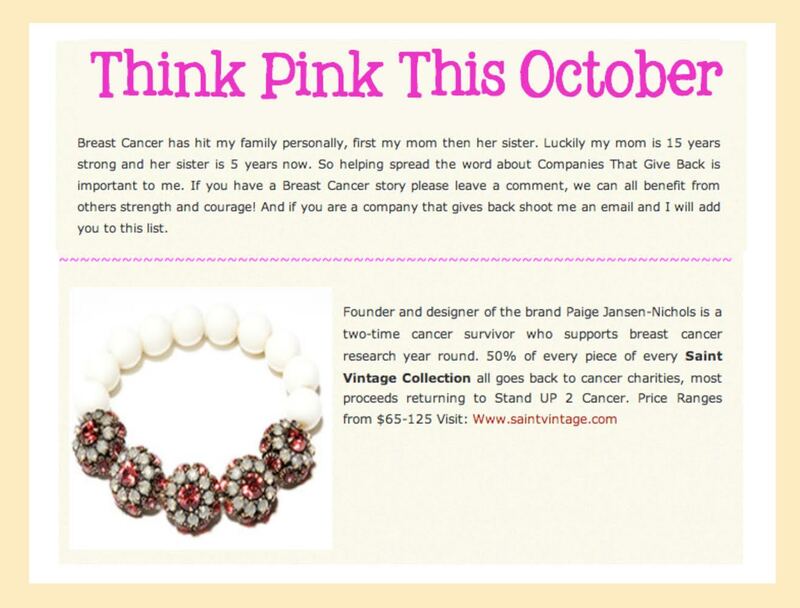 Saint Vintage is featured on the Review Wire in their guide to companies that give back during Breast Cancer Awareness Month. The Today Show's Hoda Kotb Wearing a Saint Vintage Couture Hoop Earrings. 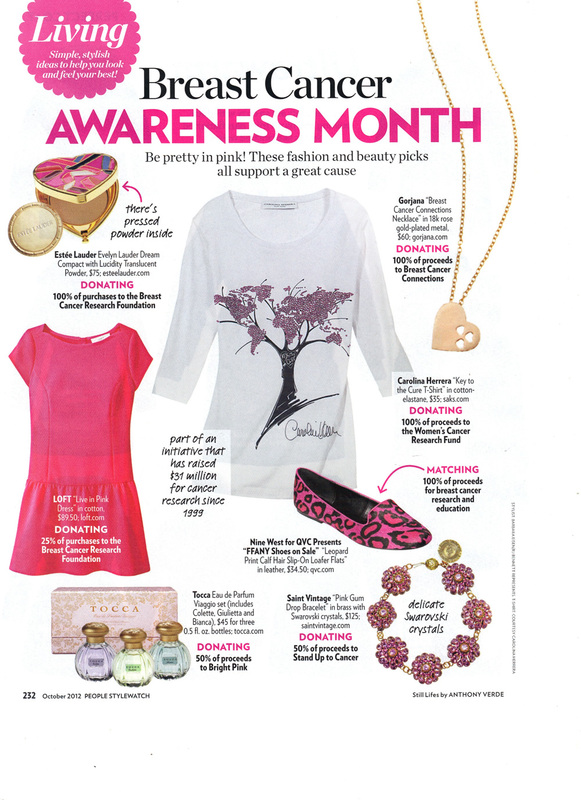 Lanya Trypupenko, writer for the Examiner, features Saint Vintage's Go Pink Campaign. The Real host,Tamera Mowry, wearing Saint Vintage Couture earrings & a Teal Love Links bracelet. Access Hollywood host, Shaun Robinson, wearing the new Saint Vintage Couture Collection necklace at the HollyRod Charity Event. 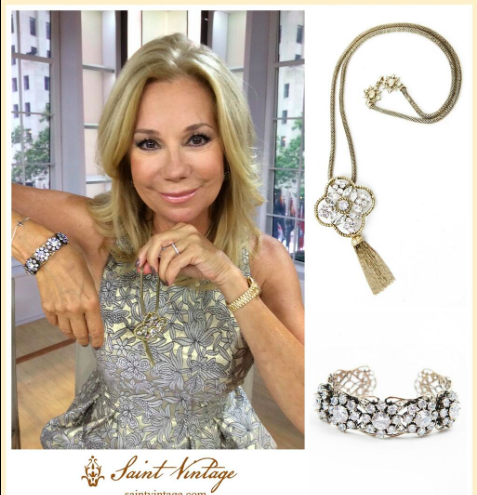 Saint Vintage Couture Collection necklace, earrings and cuff bracelet are featured on Today Show's host Kathie Lee Gifford as her favorite things. Lifestyle exert Sadie Murray shows you the hottest trends for this summer, including some fabulous Saint Vintage pieces. Celebrating International Women's Day with Charitable & Stylish Gifts. 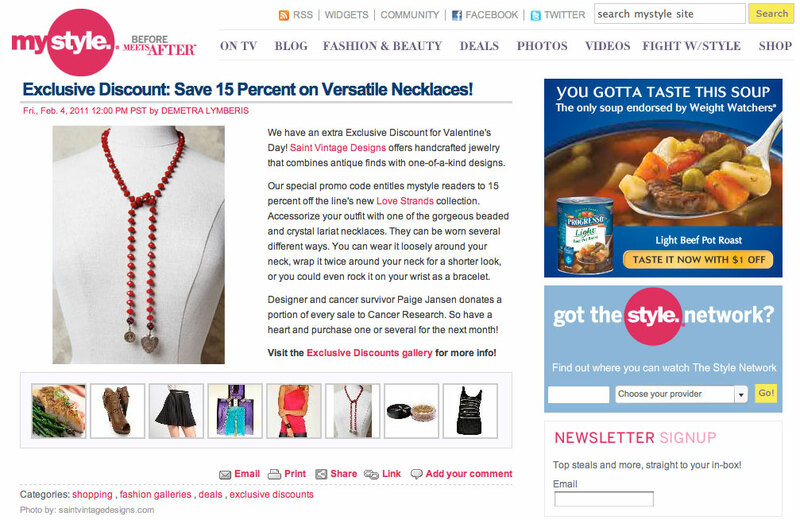 Extra's Valentine's Day Gift Guide featuring Saint Vintage Love Drop Earrings. Saint Vintage Couture Collection necklace featured on E! star Giuliana Rancic's gift guide. Acess Hollywood host, Shaun Robinson, wearing the new Saint Vintage Couture Collection necklace at the Dancing with the Stars finale. Saint Vintage Crown Ring Worn During a Teen Vogue Photo Shoot. 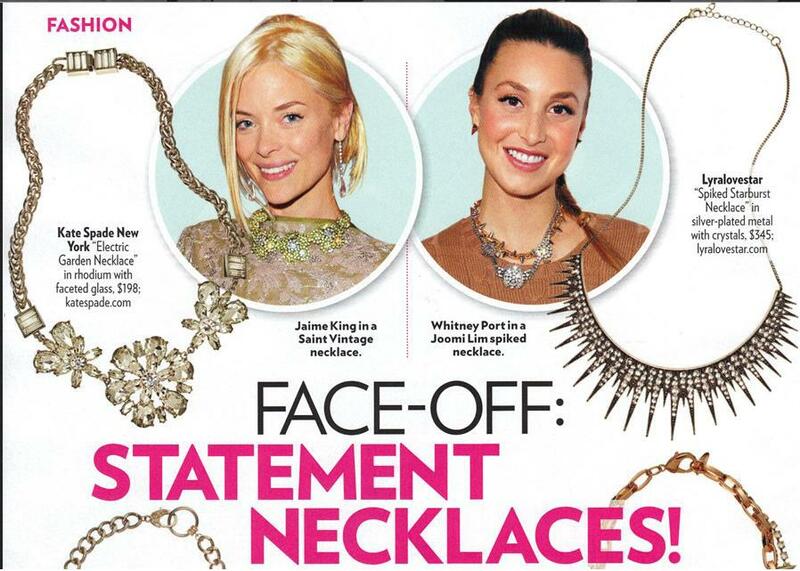 SV Necklace Worn by Actress Jaime King in People Style Watch. The Today Show's Kathie Lee Gifford Wearing a Saint Vintage Necklace. Saint Vintage Accessories Line Worn by Actress Jaime King Features the Midnight Iridescent Crown Necklace. Saint Vintage Floral Love Drop Earrings Featured in Bridal Guide as a "Best Beauty Find". Jaime King in a Saint Vintage Necklace. Saint Vintage Donating 50% of Profits to Stand Up To Cancer. Amy Poehler laughing with Eric Stonestreet at the Saint Vintage jewelry bar during the Variety pre-Emmy bash in L.A.
Universal Recording Artist, Mayra Veronica, attends Variety's Women in Film pre-Emmy Saint Vintage event. 20% Off of Saint Vintage Jewelry. Two-time cancer survivor, advocate and jewelry designer Paige Jansen was joined by a host of celebrities when she launched her fall 2011 collection for Saint Vintage jewelry in honor of the late producer Laura Ziskin and Ziskin's Stand Up to Cancer organization on Saturday at the Soho House in West Hollywood. 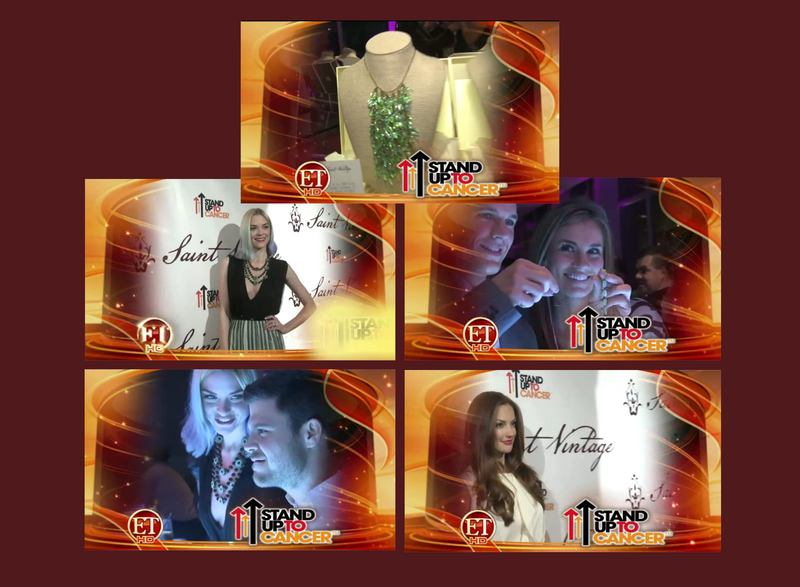 Minka Kelly & Jaime King hanging out at the Saint Vintage/Stand Up to Cancer event in L.A. ET Coverage of the Stand Up to Cancer Event. Actress/model Jaime King was joined by some of her celebrity pals on March 22 for the launch of the “Love Tour,” a jewelry fundraising event by Saint Vintage to support Stand Up To Cancer (SU2C). In Style | Jaime King and Minka Kelly Stand Up for a Cause and More! Minka Kelly joined hostess Jaime King at last night’s West Hollywood Saint Vintage “Love Tour,” an annual event that kicks off a yearlong campaign benefiting research organization Stand Up To Cancer. A star-studded affair for the launch of Saint Vintage jewlery at Soho House. Five years ago Paige Jansen-Nichols was diagnosed with kidney and colon cancer. Surgery followed, then chemotherapy. “During chemo I knew I had to do something,” she says. “Watching children and the elderly experience this was the worst part about being sick, and it changed me.” That “something” became her jewelry line, Saint Vintage. Not your grandma's costume jewelry... Saint Vintage has wonderful vintage inspired pieces without the estate jewelry price. Hand crafted featuring antique and vintage embellishments, semi-precious stones, Swarovski crystals, vintage beading & antique pearls. Here's a V-Day favorite. A little red, a little bling and at $125 still a cute gift even if you just met her. Lisa Rinna, A Jewel in Blue. Atlantan Paige Nichols keeps Hollywood Stars Shining. See Page 58. Reality TV Star, Melissa Rycroft, Wearing Saint Vintage. American Idol Finalists Rocking Saint Vintage Jewelry. The Antique-Inspired Line Loved by Rachel Bilson Inlcudes Bright Ear Bling. Breezy Mama's Mother Day Gift Ideas. Celebs Come to Andaz in L.A. to Show Their Support. Saint Vintage, the vintage accessories line with a modern twist. Saint Vintage selected and featured as "Green Buy of the Month" by People Style Watch. Saint Vintage recognized as an active supporter of cancer research. The vintage-inspired jewelry from Saint Vintage Designs is fabulous! The rings, necklaces, earrings, bracelets & bangles are hand-crafted with antique beads, gems, chains and pendants. Give an inspired gift this Valentine's Day. Saint Vintage Designs Triple Strand Bronze Bracelet. Share the love: a portion of every Saint Vintage Design purchase goes towards cancer research. Exclusive Discount: Save 15 Percent on Versatile Necklaces! We have an extra Exclusive Discount for Valentine's Day! Saint Vintage Designs offers handcrafted jewelry that combines antique finds with one-of-a-kind designs. Stylebakery just posted a piece on SVD! Stylebakery.com has 43,677 unique visitors per month. Whoo Hooo!. 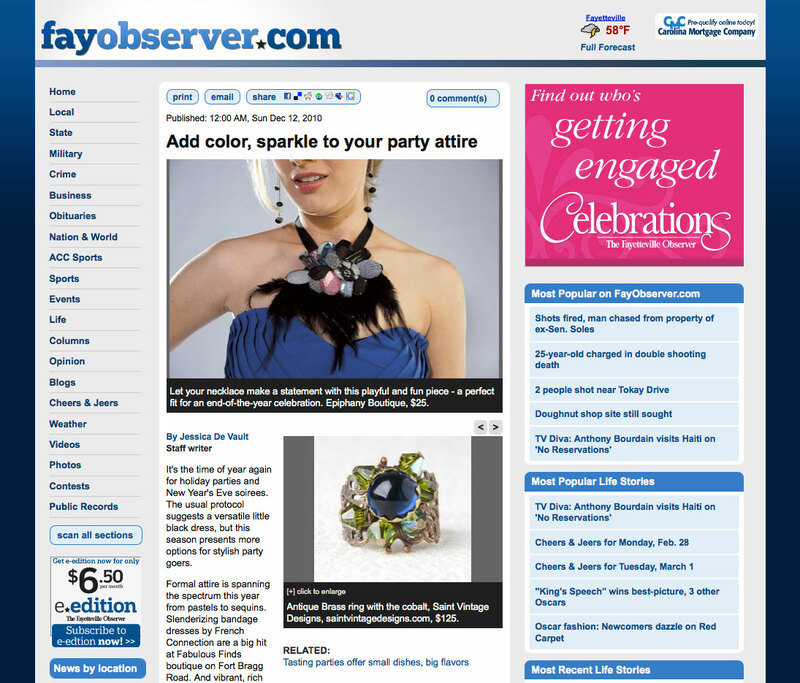 The Fayetteville Observer has featured a few pieces from the Saint Vintage Designs ring collection in todays Weekender edition. The love keeps on coming...Ho Ho Ho. 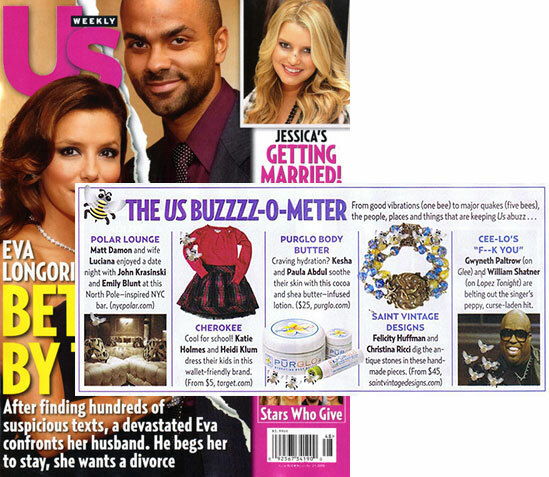 Saint Vintage Designs was just featured in US Weekly! Felicity Huffman and Christina Ricci dig the antique stones in these handmade pieces. 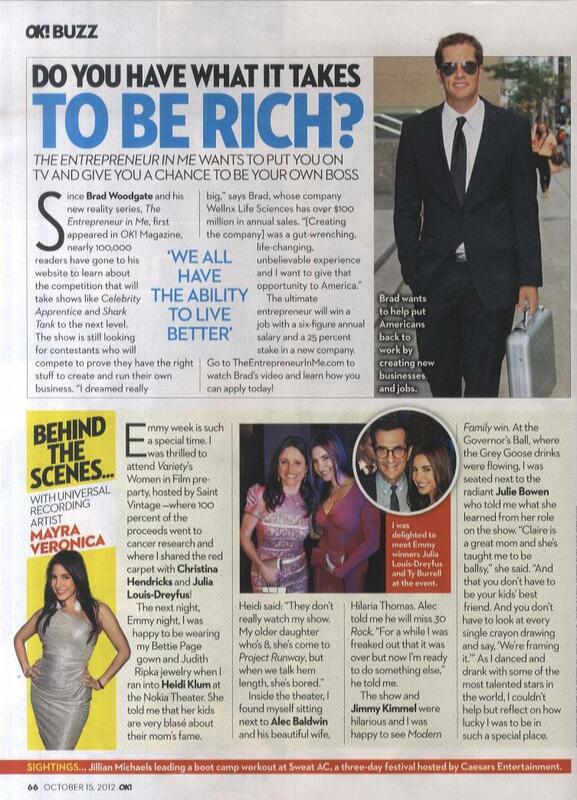 Saint Vintage Designs was just featured in InTouch Weekly! Christina Ricci was spotted wearing a red SVD Love Strands lariat necklace!.